The 2011 Arab Games is the 12th quadrennial Pan Arab Games and took place in Doha, Qatar from December 6 to 23, 2011. This was the first time that the country had hosted the multi-sport event. Khalifa International Stadium was the main venue for the competition. 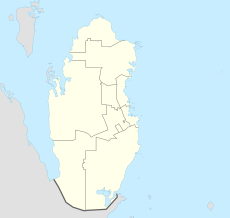 Location of Doha in Qatar. Qatar was awarded rights to organise the games beating Lebanon in the bidding process. Arab Federation for Sports secretary general Othman al-Saad said that Qatar's hosting of the Pan-Arab Games would give the event "more momentum and significance in light of the huge capabilities and world-class sports facilities which Qatar owns." Khalifa International Stadium was chosen to be the focal point of the games, hosting the opening ceremonies,while the closing ceremonies was held on Jassim Bin Hamad Stadium. Wathnan was designed as the mascot for the Games. It's a white horse, which is very important in Arabian culture. Initially, all twenty-two nations of the Union of Arab National Olympic Committees were scheduled to compete at the games. However, Syria withdrew its team in November 2011 in protest of the Arab League's suspension of the country's membership. ^ "General Schedule". 2011 Arab Games Doha. Archived from the original on 7 January 2012. Retrieved 8 December 2011. ^ National Committee for co-ordinating Conferences and Events. Retrieved on 2010-07-13. ^ Qatar awarded rights to host 12th Pan Arab Games in 2011 Archived 2011-09-30 at the Wayback Machine published by the Qatar Olympic Committee on 2008-10-07. Retrieved 2011-03-10. ^ Doha first in the Persian Gulf region to host Pan-Arab Games Archived June 7, 2011, at the Wayback Machine. Gulf Times (2008-10-07). Retrieved on 2010-07-13. ^ Syria boycotts the Arab games in Qatar Archived 2012-03-11 at the Wayback Machine. Xinhua (2011-11-14). Retrieved on 2011-12-11.